Is the Cove turning a corner? Off we go. Thanks to Richard Huddy for the photos. What’s the future hold for Anderson Cove? The Bremerton neighborhood is getting a new park soon and some new life is emerging on nearby 15th Street at Wycoff Avenue. 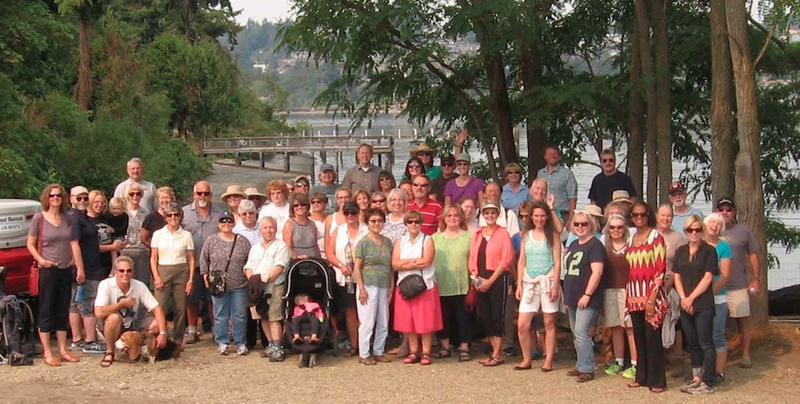 On Saturday, a group of about 70 of us took a walk to see the changes up close. We heard from Lowell and Heidi Loxsimer, purveyors of one of Kitsap County’s best breakfasts and lunches at the Hi-Lo Cafe. Then, we ventured a half a mile on foot to the Lillian and James Walker Park, which is just about ready to open. Finally, we walked back to Bualabdh Bos, Bremerton’s new Irish pub. Anderson’s Cove: Just who were the original residents who gave the cove its name? 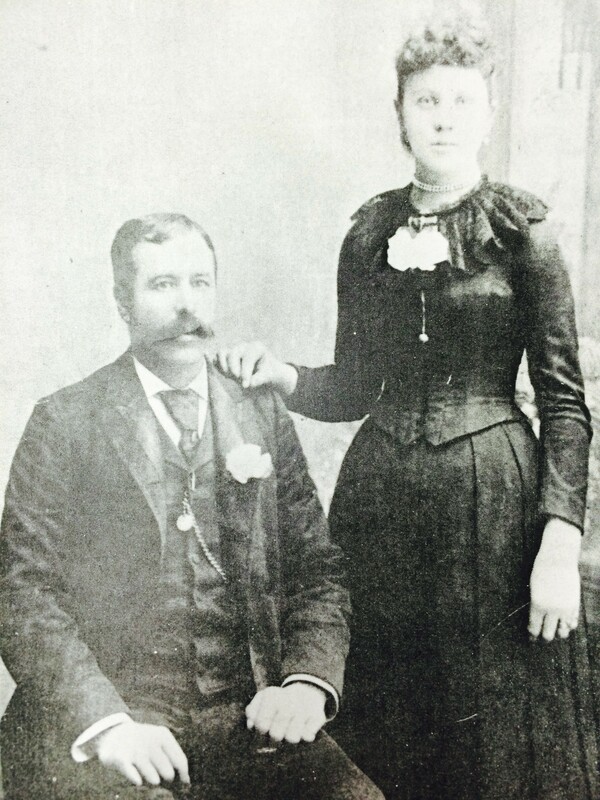 They are John Peter Anderson and Ellen Noren, both Swedish immigrants who were some of the first settlers in what’s now West Bremerton. According to Lois Jacobs’ Childhood Memories of Anderson’s Cove, John Peter arrived at Port Blakely in 1879 while his future wife would come to Seattle with his sister in 1888. John Peter Anderson and Ellen Noren. Photo from Lois Jacobs’ Childhood Memories of Anderson’s Cove. John Peter had a homestead of 160 acres in the area where Bremerton High School is now, selling it when he married Ellen and buying 40 acres at their now-namesake cove. Sadly, John Peter died in 1904, leaving Ellen to raise eight children on her own, not to mention tend for the couple’s cows, chickens and orchard. The Navy took much of the land for housing to accommodate the city’s World War II building boom. Some of that housing and infrastructure exists to this day. There was a bridge? : A bridge once crossed Anderson Cove, first to just foot traffic and later another for vehicle access, according to Jacobs. It’s hard to know where exactly the crossing was (I couldn’t find more detail) but it’s likely the cove and surrounding marshlands used to go further south, necessitating a route across them. The Hi-Lo Cafe Secret: Heidi and Lowell Yoxsimer explained that while the food they’ve been cooking up since 2006 is a big part of their success, part of it is just enjoying themselves. “You have to keep it fun,” Heidi said. The cafe recently expanded to open a waiting area to give customers a place to standby until a table opens. One thing I learned has been talk of a city plan for a Lulu D. Haddon Park business district and community hub. But Hi-Lo, it turns out, is simply ahead of its time. James and Lillian Walker Park: Colette Berna, the city’s park architect whose works include the revamped Lions, Kiwanis and Blueberry parks, gave some history on the site. The city was able to purchase four properties and develop this .62 acre site with a $1.3 million state Department of Ecology grant. Since then, they’ve used the money to install just about every technique at capturing stormwater to keep it out of Puget Sound. That includes a sand filter collection system, pervious sidewalks, a biorention swale and a Filterra system. The parks department received $172,000 from the city’s allocation of federal Community Development Block Grant funds, creating a small amphitheater, grassy hillside and steps to the beach below. It’s slated to open in a month or two. 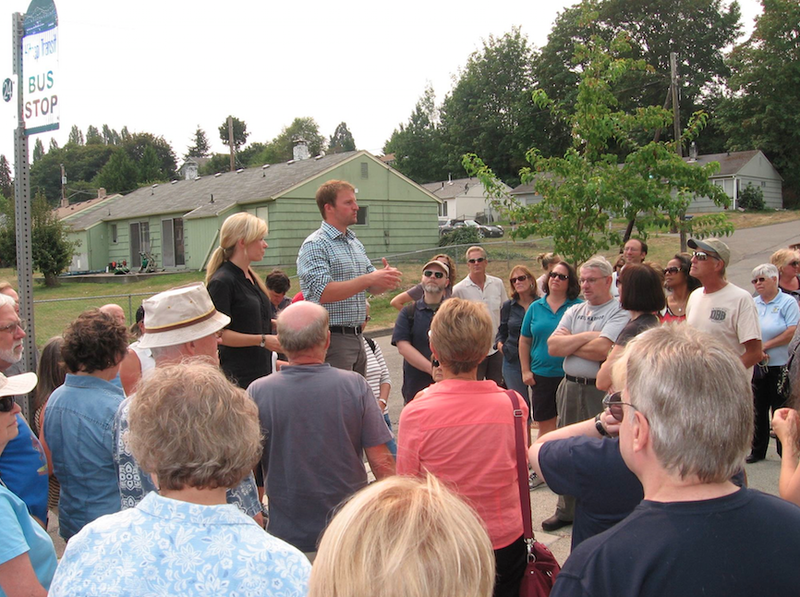 The park was named by the City Council for Lillian and James Walker, whose civil rights work during the war and later years made Bremerton a fairer place for all. And may you be in heaven half an hour before the devil knows you’re dead. 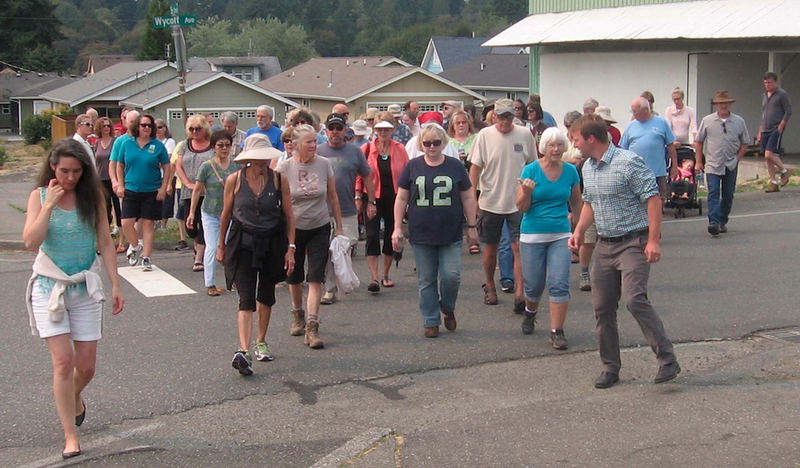 Thanks to everyone who made this latest Story Walk successful. See you in September for a walk through the old East High School campus. Details to come. What a treat to see the park fill with all of these lovely neighbors!!! Thanks again, Josh! Would you support a 'fast' ferry to Seattle if it meant some kind of a tax increase?